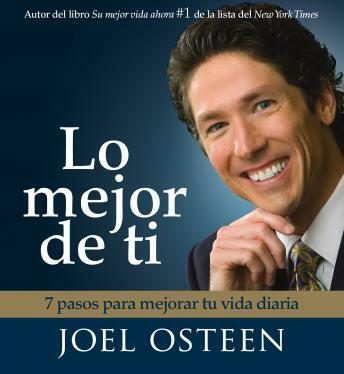 Joel Osteen is America's pastor-and that includes the Spanish-speaking population in this country. With his weekly televised services and his travels throughout the country, no one has more influence in spiritual matters than Pastor Osteen. His first title, Your Best Life Now, was a huge bestseller (the Spanish edition sold over 40,000). His weekly televised services, one of which is in Spanish, are viewed by millions of people around the world. His four weekend services in Houston bring 40-60,000 people weekly. Your Best Life Now offered audiences guidance for living a good life. In Become a Better You, he guides listeners to look within themselves for their authentic soul. Osteen helps listeners conduct an examination within so they can uncover the core of who they really are. Beatific and inspiring, Pastor Osteen weaves in Biblical lessons and personal stories that both educate and enlighten.